Effectively defending the 2nd Amendment requires us to go on the offensive. We cannot wait, unprepared, for the next assault from the radical left. Although we may have a friend in the White House, Cuomo and the radical left still reside in Albany. Politicians and candidates look at each individual and organizaton in terms of can they help, can they hurt me or do they matter at all. 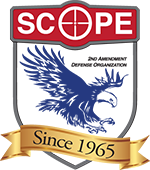 We can help candidates in a number of ways but the most eﬀective is with money, that’s where SCOPE PAC comes in and where each individual gun owner can help. There is estimated to be about 4 million gun owners in New York and if all those gun owners just do- nated a dollar each month we would have millions to work with. All we are asking is that you, our members and other gun owners donate at least that much to SCOPE PAC. It’s not a lot to ask, so please help. Help elect Representatives Who believe in the Second Amendment.